TimVideos.us and Google Summer of Code 2016! This is a cross post from the HDMI2USB website. The TimVideos.us project is happy to announce that it has been selected to participate in the Google Summer of Code for 2016 (GSoC). GSoC is a program where students are paid to contribute to selected open source projects over the northern hemisphere summer, flip bits not burgers! The application period is now open and students have until 25 March 19:00 UTC to apply to work with the TimVideos.us project. The list of proposal ideas includes contributing to the HDMI2USB and things related to the Numato Opsis. Working on USB 3.0 support for ultra high speed video capture. Porting a real operating system such as Linux or RTEMS to our SoC to allow easier development of new features. Making use of the Ethernet interface for connecting multiple devices together and alternative capture interfaces. Creating new expansion board and supporting the professional SDI standard. If you are interested in applying, your first point of call should be our Google Summer of Code page. Even if you can’t apply to GSoC, you can also help us by forwarding this message to anyone you might think who is interested! First V2 “HDMI2USB Production Board” constructed! 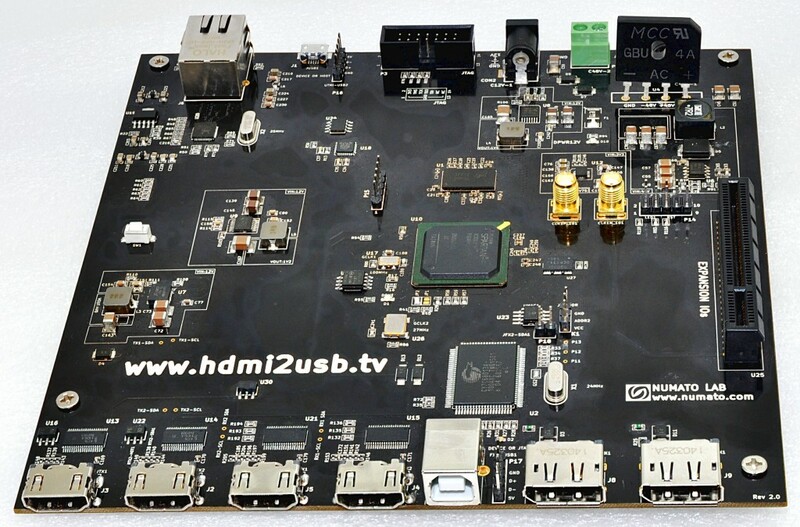 For the last year and a half, I have been working with Numato Labs to create a “HDMI2USB Production Board” for our HDMI2USB firmware that was originally developed on the Digilent Atlys board. On Friday, they sent me a picture of the first constructed board! A “de facto standard” for locking HDMI ports was established and low cost connectors became available. This meant we no longer needed to support both DVI and HDMI connectors, reducing the complexity significantly and solving some persistent issues. Not only did the cost of Spartan 6 parts with high speed “GTP” transceivers drop but our understanding of how to use them increased. This would allow us to create a board which natively supports DisplayPort. The idea streaming via not only USB, but also Ethernet became a stronger possibility, meaning the extra cost of adding ethernet was now worth it. Has DDR3 memory instead of DDR2, increasing the memory bandwidth. Has a Spartan S6LX45T with the GTP broken out to DisplayPort headers. Has a PCI-Express style expansion connector instead of the expensive VHDCI connector, allow much cheaper expansion boards. Has all the extra pins on the FX2, increasing the potential USB interface options. Has control over all the HDMI functionality, including hot plug and CEC functionality. Removes parts we don’t need such as the audio, buttons, switches and LEDs. Mounts in any ITX style computer case.